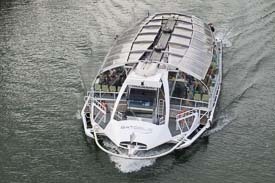 ABOVE: The Batobus is a "hop on, hop off" water bus on the River Seine. Left Bank: Tour Eiffel, Musée d'Orsay, Saint-Germain-des-Pres, Nôtre-Dame, Jardin des Plantes. Right Bank: Hôtel de Ville, Louvre, Champs-Elysées. From these stops, you can easily reach the leading sights in central Paris. You can hop on and off the boats as often as you like. Fares: The last time we checked in late May, 2018, adult fares ranged from €17 (one-day pass) to €19 (two days), with lower rates for children. Substantial discounts are available to holders of student, RATP, or SNCF cards. If you decide to settle in for a long stay, you can buy an annual pass. You can also buy a two-day "Paris a la Carte" Pass that gives access to the Batobus plus L'OpenTour Buses and their 50 stops. Where to buy passes: Online, at any Batobus stop, at the Paris Tourist Office, and at other authorized locations. When the boats run: Year-round, with frequencies of 20 minutes (summer) to 30 or 45 minutes (winter). See the Batobus "Timetables" page for seasonal hours of operation and special notices about station closings.